At ALD we look for unique and beautiful solutions for landscaping challenges. Hardscapes such as patios and pathways provide walking and gathering areas; softscapes such as lawns and garden beds provide the living, growing touches. One aspect of softscaping is ground cover; its purpose is just what its name says – covering the ground. The most popular ground cover is turf grass, also known as lawn. Turf grass is a suitable cover for almost every place, because it succeeds in providing cover. But sometimes very challenging growing conditions such as steep slopes, wet areas, and uneven terrain prevent it from being the right solution. And because a lawn requires a lot of maintenance in terms of mowing, watering, and feeding, your lifestyle might make the upkeep of a wide expanse of lawn impractical. Ground covers can help make maintenance easier for homeowners because it can limit weed growth and prevent soil erosion while offering dense soil cover and adding color and texture. They are very versatile because they grow in different heights. Some are only an inch tall, while others are several feet tall. Ground cover plants can be clumping or running. They can solve problems and help to meld different parts of a landscape such as sidewalks, driveways, and steps. They can provide transitions between the turf grass area of a landscape and gardening or vegetable beds. They can also help in directing traffic by edging different areas of the landscape. Ground cover options include much more than foliage plants, although they are the mainstays. Many offer colorful flowers, attractive fruit, and differing colors and texture which can be a great accent to a yard. 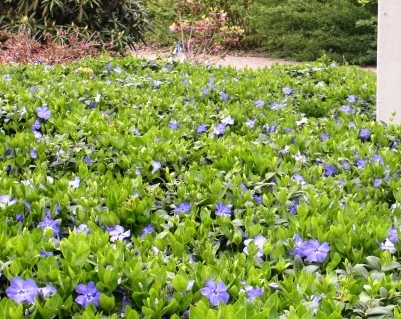 When used in mass plantings, ground cover like vinca minor with its small glossy leaves and purple flowers can be used in large curved plantings to create a feeling of lushness. In contrast, larger textured plants can make things seem closer. Different ground covers work better in different conditions. Some sun accepting ground covers are creeping phlox, moneywort, lemon thyme, stonecrop, and speedwell. Plants that do well in shade or partial shade are bishop’s weed, bugleweed, ginger, lily of the valley, barrenwort, plantain lily, dead nettle, yellow archangel, spurge, and periwinkle. If there is an area that needs to be covered with an invasive ground cover, some plants that fit that bill include bishop’s weed, bugleweed, and lily of the valley. If moist soil is a problem bishop’s weed, bugleweed, ginger, sweet woodruff, plantain lily, speedwell, and periwinkle will do well. Have you you got a challenging area in your yard that grass just won’t solve? Give us a call – we can work with you to add natural solutions such as ground cover and other unique plantings to turn those problem spots into beautiful landscape elements.